← May Day 2016 Protests. Thousands of protestors converged on downtown Los Angeles streets to protest immigration laws and Donald Trump. [LOS ANGELES, CALIFORNIA] June 5, 2016. 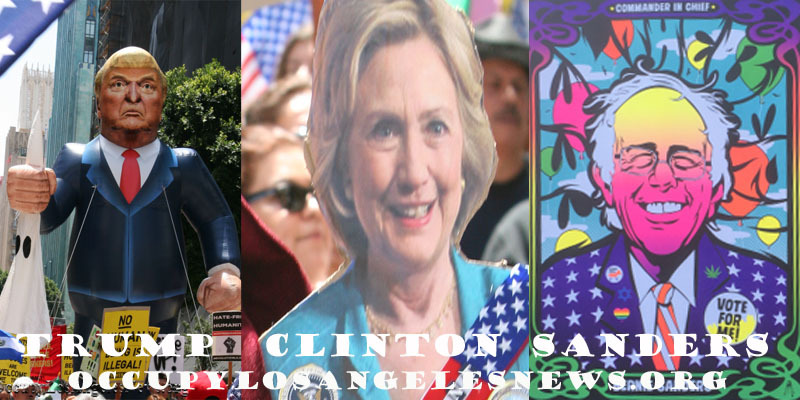 For President of The United States, Californians have three choices to vote for on Tuesday June 7, 2016. Real estate businessman Donald Trump is the presumptive Republican nominee currently running for the Presidency of The United States. And Secretary of State Hillary Clinton, likewise, is expected to be declared the presumptive nominee of the Democratic party after Tuesday’s primary in New Jersey close. New Jersey’s polls close three hours ahead of California’s. Senator Clinton currently leads the delegate count for Democrats and is expected to secure the nomination with the number of delegates she will receive this weekend from the US Virgin Islands and Puerto Rico combined with those she will win on Tuesday night in New Jersey. Senator Bernie Sanders would need a sweeping number of “super delegates” to switch to him from Secretary Clinton to win the nomination. As the presumptive nominee of the Democrats, Secretary Hillary Clinton will succeed President Barack Obama as the party’s leader and standard bearer for November’s general election. It is currently too late to register to vote in the primary however to vote in the general election please visit LAVote.net to register to vote in the future. This entry was posted in Cataloged Recent Posts, Occupy Local News, Occupy National News and tagged bernie sanders, Donald tRUMP, Hillary Clinton, Mexican, RACIST Donald Trump, Wall around United States. Bookmark the permalink.